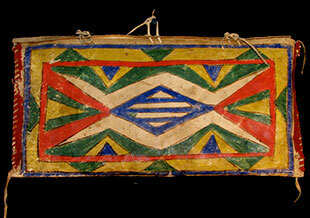 The parfleche, or painted rawhide saddlebag, was developed in Native American Plains cultures. These tribes were under increasing pressure from Euro-American expansion into the west and north that began during the early eighteenth century. At the same time, the horse enabled Native Americans to travel greater distances and haul heavier loads. Horses were also faster, making it easier to follow the bison herds and to fight one’s enemies. In these Plains cultures, dominated by the horse and increasingly nomadic, the parfleche became a vital communication tool, style and visual syntax identifying the rider and, no doubt, particular artists, to the tribal cognoscenti. The tough rawhide was waterproof, light and strong enough to be used as a shield if necessary. 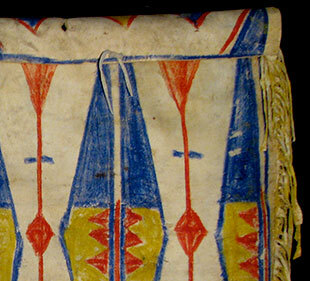 According to Gaylord Torrence in his seminal catalogue, The American Indian Parfleche(1994) their origin is not definitively known, although they certainly seem to have a relationship with hide painting and designs from Woodland people before they migrated, mounted, toward the Great Plains. The earliest mention of parfleches by a Euro-American dates from 1819, and they have been much admired since. This exhibition at the John Molloy Gallery displays the range and depth of this tradition. 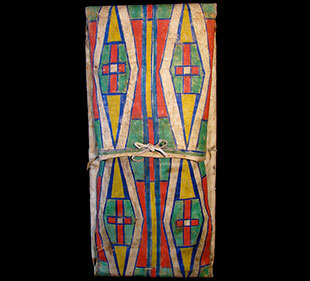 The pair of N. Arapaho elliptical cases (circa 1880) displays a bold abstract design that energizes its surface and its framing rectangle. The tension and play of object-ground relation further energizes the surface.The red, yellow and blue vertical designs seem volumetric, and suggest a human form. The slightly later Nez Perce Plateau Envelope has a more prominent frame but the elongated hourglass shapes activate the surface by visually applying pressure to their containing vertical shapes. 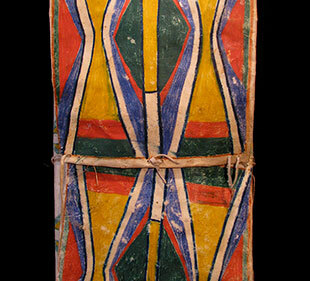 Parfleche were painted by the women of the tribe on rawhide stretched out with stakes. After setting the vertical boundaries, perhaps with a guide, the painting was done freehand with bone tools. It was necessary to paint when the rawhide was still somewhat wet. While this allowed the pigment to soak into the leather it also meant that there could be no revision. The painter had to envision the finished design before beginning to execute it. The marvellous box-shaped parfleche in this show, shows how the vibrant painted surface is offset by the non-colored fringe. 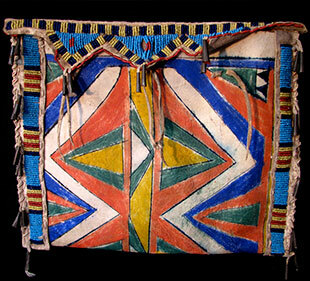 The debate about art and artifact flips and flops in the history of material collected from Native American nations. Appreciation for the formal elements of these objects has led to museum shows “as art” from the nineteen-twenties on, while the desire to place them in context has led to anthropological displays of “useful” objects or artifacts. Both these situations, of course, cannot be extricated from a history of conquest and exploitation. But let us turn, for a moment, to a discussion of design and painting and consider those things we think we know about them. Abstract painting has become inextricably bound up with discussions of modernism in North America. This refers to modernism operating in its truest sense, in which the artistic endeavour becomes all about the self-referential. 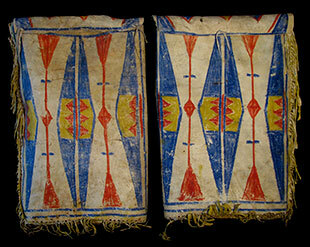 But abstraction can and does appear in functional items, such as Native American parfleches. To ignore this fact is to relegate art to a very small sphere of activity, objects created especially for a rarefied market. Many point out that there is almost always no word for “art” in non-Western cultures. I have pointed out elsewhere that the categories of the modern shift radically when one looks outside of Euro-American culture, and certainly a nomadic people has a different need for design than an early industrialist. This does not mean, however, that a functional object did not also play an aesthetic role in its original culture. Let us free ourselves from unnecessary strictures and appreciate the parfleche as an indigenous tradition of abstract painting, created as the modern world expanded and changed the life of the Plains nations forever.